Nepal is very ancient country which was ruled by many dynasties in the past. Among them, the Kirat rule is very significant one being the longest period that extended from pre-historic to historic period. In ancient Hindu Scriptures, Nepal is referred as the “Kirat Desh” or “the Land of Kirats”. Kirats were indigenous people of Mongolian origin with stout and short stature, high cheek bones, flat noses, narrow black eyes and thin moustaches and beards. They were brave and doughty warriors and very deft archers. Before the advent of the Kirats, there were Ahir and Abhir rule in the valley. The last king of Abhir dynasty Bhuban Shima was overthrown by Yalambar, the first Kirat King. Thus after defeating the last ruler of Abhir dynasty, Yalambar laid the foundation of the Kirat dynasty that lasted for about 1225 years. When Kirats occupied the valley, they made Matatirtha their capital. The Kirat kingdom during the rule of Yalambar had extended to Tista in the East and Trisidi in the West. It is said Yalambar had gone to witness the battle of Mahabharata between the Pandavas and the Kauravas. He was so brave and powerful that Lord Krishna beheaded him prior to the battle suspecting he might fight for the Kauravas. The Kirats revere him as God King these days. It was during the rule of Jitedasti, the 7th Kirat king; Lord Gautam Buddha had visited the valley with his several disciples. He visited holy places of Swayambhu, Suheswari etc and preached his religious gospels. Kirats of the valley refused to follow his doctrine but welcomed Lord Buddha and his disciples. It is also said that King Jitedasti had helped the Pandavas in the battle of Mahabharata. It shows, of course, a historical anachronism because according to another legend, the battle Mahabharata had taken place during the resigm of King Yalambar. During the rule of 4th Kirat King Sthunko about 2250 Bc, the Indian Emperor Ashok had his inspections engraved on rocks and a stone-pillar. The pillar known as Ahok-pillar still stands. This historical monument was unknown to the world until it was discovered by Dr. Fuher in December 1985. Neapl Govt. has prepared a master plan to protect and develop Lumbini region as religious tourism destination. Emperor Ashok also came to the Kathmandu Valley later. He was accompanied by the daughter princess Charumati. During his stay in the valley, he had built four stupas in four directions and one in the centre of Patan. These monuments speak of the historical fact of Ashok’s visit to the valley. Another fact is he had arranged his daughter Charumati’s marriage with a local young prince named Devpal. Prince Devpal and his consort Charumati lived at Chabahil near Pashupati area. Later Charumati had built the touss of Devpatan after the death of her husband in his memory. Charumati who had later on become a nun herself also got erected a convent where she resided and practiced Lord Buddha’s doctrine. Buddhism, thus entered Nepal and flourished during the liberal rule of the Kirat dynasty. Like Buddhism, another religious doctrine Jainism was being preached the same time by Mahavir Jain in India. In this regard, Bhadrabhau, a disciple of Mhavir Jain came to Nepal in about 300 BC when the 17th Kirat king Jinghri was ruling. But comparatively, Jainism could not gain popularity like Buddhism in Nepal. When the 28th Kirat King Paruka was ruling in the valley, the Sombanshi ruler attacked his regime many times from the west. Although he successfully repelled their attacks, he was forced to move to Shankhamul from gokarna. He had built a royal palace called “Patuka” there for him. The ‘Patuka’ palace is no more to be seen now except its ruins in the form of mound. Patuka had changed Shankhamul into a beautiful town. The last King of the Kirat dynasty was Gasti. 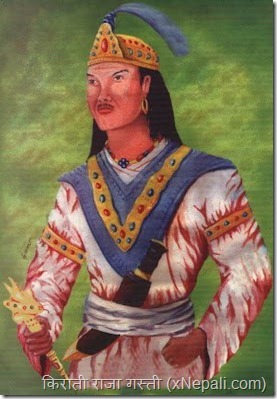 He proved to be a weak ruler and was overthrown by the Sombanshi ruler Nimisha. It brought to the end of the powerful Kirat dynasty that had lasted for about 1225 years. After their defeat, Kirats moved to the Eastern hills of Nepal and settled down divided into small principalities. Their settlements were divided into there regions, i.e. ‘Wallokirat’ that lied to the East of the Kathmandu, ‘Majkirat’ or Central Kirat region and ‘Pallokirat’ that lied to the far East of the Kathmandu valley. These regions are still heavily populated by Kirats. The long rule of Kirats manifests that were strong and well organized people. Their society, administrative ststem and economy were well organized. Later, their sucessors Lichhavis also gave due importance to their legacy. They exerted great influence not only in the valley but outside it in the Eastern region also. We still find many places, hills and rivers that named after the Kirat languages. Kirats enjoyed a free and open society. There was no gender discrimination. To facilitate justice system in the public, law courts were established at many places and effective laws weremade to deal with crimes and offences. Nepal had trade link with India, Tibet, then a free country and China. Nepali businessmen carried out trade with these countries. Nepal chiefly exported wool, wollen goods, timber and herbs. Chanakya has mention in his famous book “Kautilya Arthasastra” that Nepali blankets had a big market in bihar then called Magadh. As there was more financial prosperity in trade, more people were ingaged in business than in agriculture. This factor also led the migration of people of different racial origin with their own customs and cultures to Nepal. In course of time, thse people merged into the main national stream and the part and parcel of one nation tha helped to create and develp a healthy feeling of nationalism. By religion, Kirats were originally nature worshippers. They worshipped the Sun, the moon, rivers, trees, animals and stones. Their primeval deties were Paruhang and Sumnima. Hinduism were introduced to and imposed on the Kirats only after the conquest of Goirkhali rulers whose root was in India. Kirats were quite tolerant and liberal to other religions. That’s why Buddhism flourished during the Kirat rule in Nepal. Buddhism had inkindled a new interest and attitude among the people. Kiratshad had also built many towns. Shankhamul, Matatirtha, Thankot, khopse, Bhadgoan and Sanga were prosperous cities with dense population. Thus it can be safely said that the Kirat period had paved the way for further development and progress of Nepal in all sectors in future. According to the Kirat Mundhum, the religion that is being followed by the Kirat people since the creation of the universe is the Kirat religion. Simplicity, racial and gender equality, religious tolerance and nature worship are the prominent features of this religion. However, with the change time, followers of the different religions tried to influence the common people by preaching superiority of their own religion and establish ‘Gurudom’ of religious sects. In this process, they made the primitive, simple religious rites and rituals more complicated by attaching concept of heaven and salvation. Such religious complications gave birth to religious organizations that created unity among them in the name of religious irrespective of their political differences. But the Kirat religion did not get opportunity to honour the professional spiritual and religious preachers and to develop their religion into permanent religious institution. In the beginning of the Christian era, the Kirat rulers were driven out by the Lichhivis towards the eastern Sanga valley. Thus, the Kirat people had to undergo religious and political suppression and oppression by alien people. But they managed to protect and preserve their religion, culture and language in its primitive form. Fearing that like their conquerors Lacchais, they may also lose their identity, Kirati today seem quite conscious to protect and preserve their Kirati identity and existence. Especially after reinstatement of democracy in the country, they are slogging away at protecting and developing their religion, culture and language and they are returning to and embracing their own religion. There was no column for Kirat religion in the population census forum, 2048, yet, 3,18,389 Kirats, 1.7% of the total population willingly wrote Kirati as their religion in the column for ‘other religion’ of the form. The census report has shown only 86,368 Rais, Limbus and Sunuwars as the followers of the Kirat religion. According to the population census, 2058, the total population of the country was 2,31,51,423. The religion wise percentage of the population was Hindus 80.32, Buddhists 10.74, Islam 4.20, Kirats 3.60, Jains 0.02, Christians 0.45, Sikhs 0.03, Bacchus 0.01 and others 0.35. The 3.60% of Kirat religion followers represent only 8,33,000 Kirat’s population. It shows that all the Kirati people did not write Kirat as their religion in this census as well. This astounding 3.60% rise from 1.7% shows that the number of Kirat religion followers exceeds 8,33,000. This is a good sign for the followers of the Kirat religion yet the saying ” All Kiratis are not the followers of Kirat Mundhum” is still true. If only the 2.24% increased population of the Kirats had mentioned the Kirat religion as their religion, the Kirat religion would have achieved the third position among the eight religions practised in Nepal. This historical event would have silenced those jealous religions leaders who oppose the Kirat religion. This would have also made those Kiratis repentant who feel shame to declare themselves as the followers of Kirat religion. The facts like exclusion of the Kirati manpower working overseas and a tendency to migrate temporarily to other countries in a great number among the Kiratis, keep alive the hope to be the third largest religion (in Nepal) in the future. The central office bearers of various organizations of the independent Kirat intellectuals and ethicists have played commendable role in gleaning data that show the significant growth in percentage in the population of Kirat religion followers. These organizations were able to persuade the government to include a column for ‘Kirat Dharma’ in the population census form, 2058. Similarly, those people, committed to protect and develop Kirat religion, have made admirable contributions and their commitment to protect and preserve the Kirat identity from being extinct, has been proved a milestone in this respect.